For the month of March, the Island Batik Ambassadors were assigned the task of making a mini quilt 24 x 24 or less, using foundation piecing or English Paper Piecing. My mini is a combination of both piecing methods, as I love to do both. So I played around in EQ7 and here it is. This is my EPP block...it measures 6". I pieced the star, then appliqued it down to the block. Here is my paper pieced compass block which measured out at 12". And here is my little quilt...all finished! My husband has long desired a Mariners Compass quilt, so here is one for him. The little light house blocks were purchased several years ago and I thought this would be a great place to use them. So glad I un-earthed them! They were made by Island Batik as well. 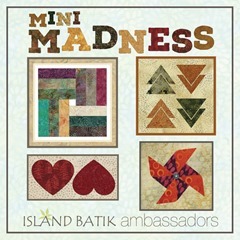 I love being an Island Batik Ambassador...the challenges are great fun! Check out some of the other Ambassadors and see what kind of mini-madness they have been up to! Sewing room...I missed you so much!